I’ve been waiting to feature this one for a while, and finally Orbit officially unveiled the cover last week! “Thieves, dangerous magic, and a weapon built with the power to destroy a god clash in this second novel of Gareth Hanrahan’s acclaimed epic fantasy series, The Black Iron Legacy. Enter a city of spires and shadows . . . The Gutter Miracle changed the landscape of Guerdon forever. Six months after it was conjured into being, the labyrinthine New City has become a haven for criminals and refugees. Rumors have spread of a devastating new weapon buried beneath the streets – a weapon with the power to destroy a god. As Guerdon strives to remain neutral, two of the most powerful factions in the godswar send agents into the city to find it. As tensions escalate and armies gather at the borders, how long will Guerdon be able to keep its enemies at bay? Can’t wait for this one myself! That cover is glorious! Ooh nice pick! That’s a new to me one! I hope you will thoroughly enjoy it once you get to read it! I’ve been seeing this one around a lot today already. Great choice and hope you love it when you get to it. I still need to read The Gutter Prayer – I was hoping for an ARC, and I’m afraid the release just slipped by me – but this sounds fantastic. I was happy to see this finally listed on Goodreads with a cover, can’t wait! I just got Gutter Prayer in a Kindle Daily Deal, so I’m one stop closer to actually reading and seeing what all the flailing is about! I have to try book 1! 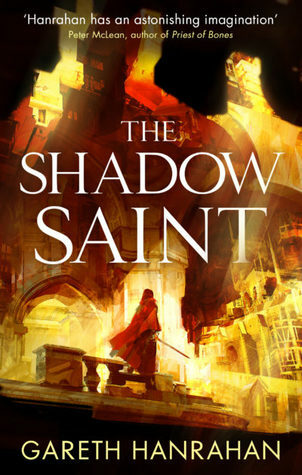 I was thinking the first book sounded pretty awesome- I love gritty fantasy city settings- and now this one comes along and looks pretty amazing too! Yup, I am excited for this one. This is a series I want to start, better get on it before I can’t catch up, lol. Interesting cover! January feels like a long time to wait though!